Here's the list of celebrated jury that AFFF managed to invite for this year. Ana Kokkinos is a Melbourne-based filmmaker whose career spans film and television. Her recent film, Blessed which premiered at the Melbourne International Film Festival in 2009 won her Golden Shell for Best Screenplay, the Contemporary World Cinema Section at the Toronto International Film Festival (2009) and the BFI Times London International Film Festival (2009). Blessed has also been nominated for 4 Australian Film Institute Awards including Best Film. Her other multi-award winning films include Head On which she directed and co-wrote with Andrew Bovell and Mira Robertson, The Book of Revelation which she directed and co-wrote with Andrew Bovell and Only The Brave which she directed and co-wrote with Mira Robertson. Films such as The Secret Life of Us, Young Lions and Eugenie Sandler Pl were also directed by Ana. She is currently a board member of Film Victoria and was an Industry Consultant and Mentor to MA Directing students at the Australia Film, Television and Radio School in Sydney, in 2007. Ana was also a participant in the Creative Stream of the 2020 Summit in Canberra in 2008. Chris Lee was formerly the head of Columbia/TriStar where he oversaw the production of films such as Jerry Maguire, As Good As It Gets and Philadelphia. After leaving Columbia, he went on to produce internationally-recognised films such as Valkyrie, Superman Returns and its sequel, Superman: Man of Steel. Lee is the founder of the University of Hawaii's Academy for Creative Media. Kabir Khan is a film graduate from Jamia, New Delhi and his film and documentary assignments have given him opportunities to travel extensively to over 60 countries. In 1998, he won the Grand Jury award at Film South Asia 2000 for his documentary, The Forgotten Arm. He moved on to direct a film, Two Assassinations and An Accident which won him Best National Film Award jointly with another film, Mechanics of Change at the Mumbai International Film Festival 2002. He was also awarded the National Critics Award. His first feature film, Kabul Express premiered in the prestigious Toronto International Film Festival 2006 and then went on to the London, Pusan, Dubai, Singapore, Casablanca and Cairo Film Festivals. At the Asian Festival of First films in 2007, he received the Best Director’s Award and the Foreign Correspondents Association Purple Orchid Award for Best Film. His second feature film, New York, released worldwide in June 2009 to much critical acclaim and box office success. The film is set against the backdrop of post 9/11 New York and was shot in a single 100-day schedule in USA. Other than filmmaking, he enjoys photography and this has won him several awards such as international photography awards at the 50th anniversary of the Geneva Convention in Switzerland in 1999 and the Nikon International Photo of the year in 2003. 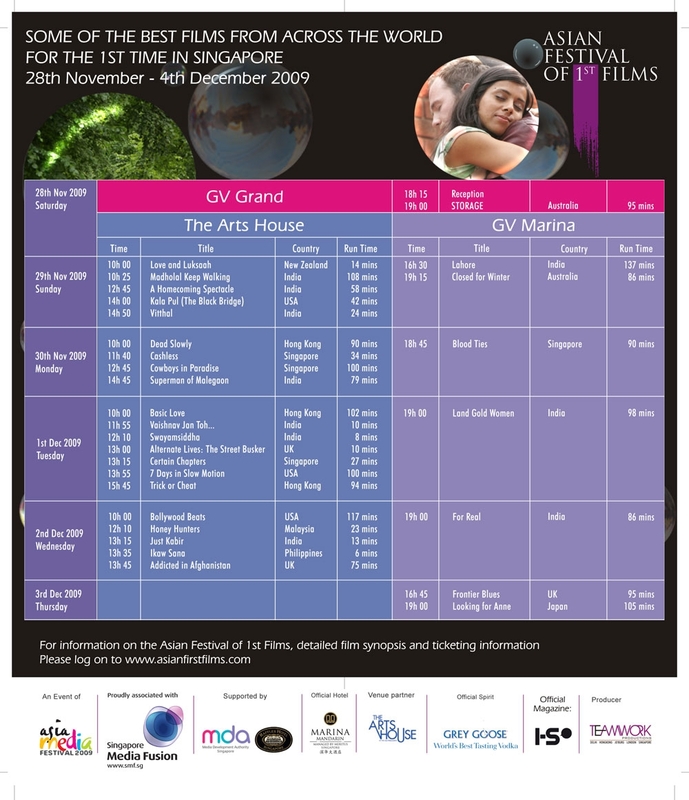 All the nominated films will be screened at Golden Village Marina and The Arts House from 28th November to 3rd December 2009. Tickets are available from the respective box offices and online (only Golden Village) at $10 each. Click here to see the schedule in full size. Out of all these films, I have only watched Basic Love on DVD before. It is a very simple movie and great when you need something to relax your mind (a no-brainer type of movie). I do think that the male actor is great, especially since he is actually from a singing background. Hopefully he may win the Best Actor award. If you are keen to watch the nominated films, they will be screened at Golden Village Marina and The Arts House from 28th November to 3rd December 2009. Tickets are available from the respective box offices and online (only Golden Village) at $10 each. Film synopses and schedules will be listed on the festival website http://www.asianfirstfilms.com/. Click here to see the schedule in full size. AFFF is a prestigious festival that celebrates first-time film and documentary-makers and provides a platform for budding film talent. This year, the festival attracted over 700 entries and Certain Chapters is the sole Tamil nominee out of the 30 nominees from 28 countries. Certain Chapters is a short independent Tamil-Language film released in Singapore. Directed by Singaporean Abbas Akbar, it reveals the world of Indian gangsters in Singapore. Click here to watch videos of Certain Chapters. The winners of the Asian Festival of First Films 2009 will be announced at the AFFF 2009 Gala Dinner in Singapore on December 4th. It will definitely be an unforgettable event for all the nominees. I was watching "Guess Guess Guess" program on Ch U last Saturday and there was this section where they invited three women to attend the show showing their pre make-up faces. Once again, it really highlighted the wonders of make-up which can transform an otherwise normal face to that of a supermodel. It was also said in the show that 80% of women in Taiwan do not go out without applying makeup. The three women on the show also said that they were treated differently by their boyfriends or suitors once the men saw their real faces. So I guess this is one of the reasons why I do not really use make-up. I prefer the person to be looking within me first rather than focus on my face. If the person does not even try knowing me first, then he is really a superficial person that I could not be bother knowing as well. But then again, all men are "visual" creatures who love looking at beautiful women. Oh well, I know I must start learning the tricks very soon, as it is always polite to dab a little make-up when attending events or in a workplace. Of course, my current and past workplaces have always been lenient on this so I guess I will put it off for a little while again. So to all friends of mine, please bear with my plain old face for the time being. Tata and it's off to work for me now.. See ya again soon! I love this song and piano piece from the movie, "不能说的秘密". If you haven't seen the movie, it will be broadcasted on tv tonight at 9pm. Enjoy the song for now.